Since a few of you have written to ask (and thank you, by the way! I love hearing from you!) 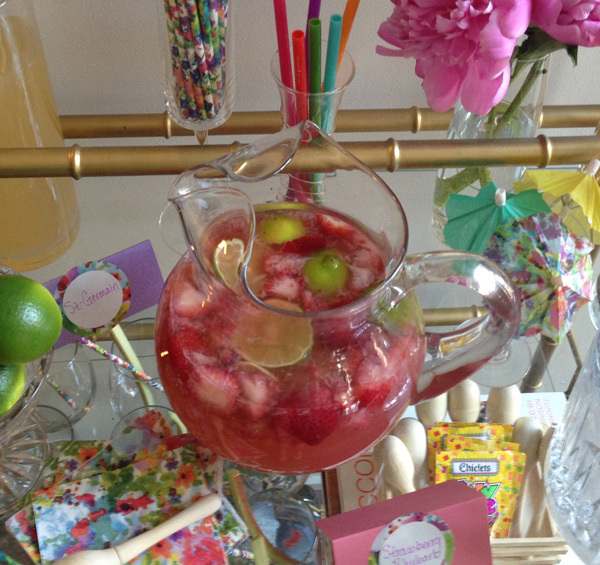 here is the recipe for Strawberry Rhubarb Margaritas from the Fiesta. First, you need to make a batch of rhubarb simple syrup. If you want, you can watch my demo here. But to put it simply, chop rhubarb into 1" pieces - you need 2 cups. Place the rhubarb in a pot with 1/2 cup sugar and 1/2 cup water. Bring the mixture to a boil on high; once it's boiling reduce the heat to low and let it simmer for 20 minutes. Strain the mixture, making sure to squeeze all the liquid out of the rhubarb, and chill. This will keep in the refrigerator for up to 2 months.